A Stunning Aero8 in excellent condition throughout, with a fantastic specification list including an AR Detailing pack with Side Exit Exhausts, Red AR Brake Callipers and much more. Painted in Crème Gloss, contrasted with Special Leather choice Yarwood Lichen and finished with Brown Velvet coloured Wood Veneers. A Stunning colour combination that is both subtle and beautiful to look at, having pride of place in our showroom. 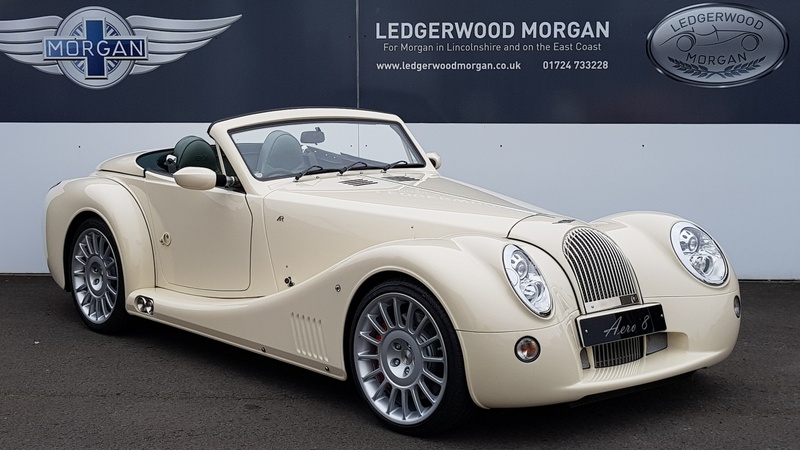 One Owner, supplied and serviced by ourselves from new, with full Ledgerwood Morgan Service History. Please contact us directly with any questions or details you may need. This is a fantastic car that we have been proud to supply and look after and an absolute must for anybody looking for a cherished Aero 8. Aero 8 with One Owner and Full Ledgerwood Morgan Dealer History. Painted in Exclusive AR Motorsport Crème Gloss with contrasting Special Leather Colour of Yarwood Lichen. Wood Trim in Dark Velvet Veneer and Carpets in Green. AR Racing Performance Pack with Side Exit Exhaust, Red AR Racing Brake Callipers, Gloss Black Rear Diffuser, AR Motorsport Detailing Pack with AR Logos. 6 Speed Manual Gearbox, 19″ Aero8 Silver Wheels. Silver Wing and Splitter Cooling Vent Mesh, Paint Protection Film, Green Mohair Hood. Black Leather Rim Steering Wheel, Heated Seats, Footwell and Toggle Lighting in Cool White.